PML is associated with both HIV-1 and HIV-2. [2, 3] HIV infection accounts for almost 85% of the total cases, and its prevalence in this population is around 4-5%. [4, 5, 6] It is currently one of the AIDS-defining illnesses in HIV-infected patients. The virus is thought to enter the body via the respiratory or oral route. After its entry, it becomes latent in the kidneys, lymphoreticular tissues, and brain. The primary infection is asymptomatic. Periods of viral replication without any clinical symptoms occur and can be detected when it is shed in the urine. When reactivation happens in the setting of immune suppression, viral replication ensues, causing dissemination to the brain. Alternatively, latent reactivation of the virus can occur in the brain itself in this setting. Viral particles are shown to be carried to the CNS via B-lymphocytes in the setting of systemic dissemination. According to a study of HIV-negative controls and HIV-positive patients with or without PML, a third of individuals from all subgroups had JC virus DNA in the urine. In the same study, JC virus DNA was detected in 43% of lymphocyte samples and in 63% of plasma samples in HIV-positive patients with PML. In HIV-positive patients without PML, however, JC virus DNA was detected in only 13% of lymphocyte samples and in 22% of plasma samples. In HIV-negative controls, no lymphocyte or plasma samples harbored JC viral DNA. HIV gene products, such as Tat, may be able to transactivate the JC viral promoter directly. This provides an additional pathogenic mechanism beyond general immunosuppression. The viral infection in oligodendrocytes is lytic. It undergoes DNA replication and synthesis of viral capsid proteins inside the cell. The virus infects other cells from a central nidus in a circumferential manner, leading to the expansion of the demyelinating lesion. Astrocytes that are infected by the virus enlarge and take bizarre appearance (distortion of the nuclei with enlargement or multiple nuclei) and resemble the tumor cells in giant cell astrocytomas. In the pre-HAART era, the prognosis in patients with PML was dismal, with death occurring in approximately 95% of patients within 4-6 months after diagnosis in most cases. Approximately 8% of patients experienced spontaneous recovery. CD4+ T-cell counts less than 100/μL at baseline are associated with a higher mortality rate. Death may result not from the neurologic condition but from end-stage immune deficiency. Patients with progressive multifocal leukoencephalopathy (PML) typically experience insidious onset and steady progression of focal symptoms that include behavioral, speech, cognitive, motor (eg, head tremor  ), and visual impairment. Though the neuropathological evaluation reveals the multifocal nature of the disease, its presentation is typically unifocal; however, MRI may demonstrate multifocal pathology. Unlike other major opportunistic disorders that produce focal brain lesions (eg, cerebral toxoplasmosis, primary CNS lymphoma), which characteristically progress over the course of hours or a few days, PML evolves over several weeks. However, PML demonstrates more rapid progression than AIDS dementia complex (ADC). Involvement of the brainstem is more commonly seen in PML associated with AIDS than with other entities. As individual lesions expand, either concentrically or along white matter tracts, manifestations may worsen and involve a larger territory. For example, initial weakness of one leg may progress to hemiparesis. Patients with more preserved immune status may show a slower progression of the disease than those with a immunocompromised state. Although seizures have been considered a rare manifestation of PML, Lima et al found that seizures occurred in 18% of PML patients. Many of the PML patients presenting with seizures had demyelinating lesions immediately adjacent to the cortex. Seizures usually responded well to treatment and did not affect survival. In PML related to immune reconstitution, onset may occur weeks to months after the initiation of antiretroviral therapy. Focal neurologic signs include aphasia, hemiparesis, ataxia, cortical blindness, limb apraxia, brainstem symptoms and, less frequently, head tremor. Focal signs tend to be related to posterior brain (eg, occipital lobes). Gait abnormalities occur in up to 65% patients, and cognitive dysfunction is seen at the time of presentation in up to 30% people. Conjugate gaze abnormalities are common. This is the initial presentation in more than 30% of patients. Abnormalities may progress to quadriparesis and coma. Occasionally, neurologic signs are diffuse rather than focal. With CT scan or MRI of the brain, single or multiple confluent lesions without mass effects are seen, most frequently in the parieto-occipital white matter. Occasional infratentorial lesions are usually asymmetrical. The demyelinating plaques involve subcortical U fibers but tend to spare the cortical ribbons and deep gray matter structures; however, cases have been described that have involvement of deep gray matter. Subcortical gray matter or the spinal cord may be involved, but rarely. Gray matter involvement has a scalloped appearance. 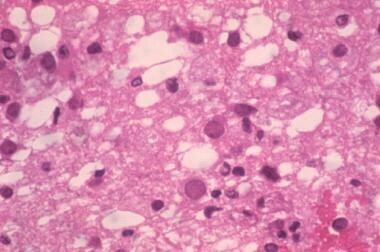 PML sometimes can resemble lymphoma, toxoplasmosis, or HIV encephalitis. However, the absence of a mass effect or displacement of normal structures is more consistent with PML than these other disorders. Rarely, PML can also present as a mass lesion with enhancement on postcontrast MRI scans. Magnetization transfer ratio (MTR) is typically low in PML cases compared with normal white matter and that of HIV-infected white matter without PML. T2-weighted MRI shows left occipital hyperintense white matter changes with the lesion margin reaching the cortex. Neuroimaging in patients with inflammatory PML may demonstrate atypical features, including a mass effect of the PML lesions with surrounding edema. Con­trast enhancement, which is uncommon in classic PML and tends to be sparse when it does occur, may be striking in patients with inflammatory PML. Any area of the white matter can be affected but is usually in the cerebellum. Cerebrospinal fluid (CSF) is usually normal, but protein levels may be elevated slightly. Normal CSF findings serve to rule out other etiologies. CSF pleocytosis can sometimes occur, but the cell count is usually less than 20/µL. JC virus culture in the CSF is usually unrevealing. Polymerase chain reaction (PCR) of the CSF has been shown to be highly specific (92-99%) and sensitive (74-93%) for the detection of JC virus in patients with PML. False negatives may be due to the low viral DNA in the CSF, storage of the specimen, low volume of the specimen, and loss of DNA during concentration. The false-positive rate has been reported to be around 2%. Measuring CSF JC virus DNA load is a reliable marker of disease activity in patients receiving HAART and has a potential use in drug trials. Conceivably, this test could eliminate the need for brain biopsy. However, the detection of JC virus in CSF may be less likely in patients with inflammatory PML. If PML is suspected, even though the initial JC virus PCR is negative, the recommendation is to repeat the spinal fluid analysis. Brain biopsy has a sensitivity of 74-92% and a specificity of 92-100% in progressive multifocal leukoencephalopathy (PML). Mild cortical atrophy may be seen on biopsy specimens. Immunohistochemistry or in situ hybridization is the best method to confirm JC virus in the biopsy specimen. Multiple demyelinative foci may be seen in the cerebral, cerebellar, and brainstem white matter and at the gray-white matter junction; in severe cases, such foci may be seen in the cortical gray matter. Foci may become confluent (see the images below). Oligodendrocytes at the gray-white junction are the most common sites of infection. JC virus infects not just the oligodendrocytes and astrocytes but also the granule cells of the cerebellum. 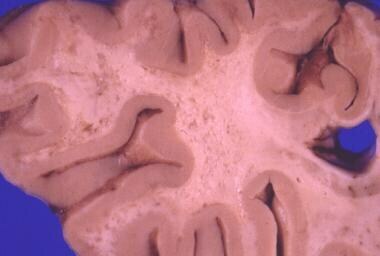 This sliced fixed brain shows multiple isolated or confluent gray demyelinative foci. Atrophy may be present. Contributed by Dr Beth Levy, Saint Louis University School of Medicine, St Louis, Missouri. Microscopically, multiple demyelinative foci are detected. The microscopic hallmark of the disease is intranuclear basophilic or eosinophilic inclusions within the swollen nuclei of oligodendrocytes, often at the periphery of lesions. Large, occasionally multinucleated astrocytes with prominent processes are another characteristic feature. Contributed by Dr Beth Levy, Saint Louis University School of Medicine, St Louis, Missouri. Perivascular inflammatory infiltrates are observed. Necrotic and cystic lesions may be present but are rare. The diagnosis of PML remains less certain in the possible PML category. *Histopathologic triad: demyelination, bizarre astrocytes and enlarged oligodendroglial nuclei. **Presence of clinical and radiologic evidence not resulting from other disease processes increases the certainty of this category to definite. Mefloquine has been suggested as one of the options based on its in vitro activity against the JC virus, but a recent trial showed the lack of efficacy. The current consensus is that interferon-alfa does not help in the treatment of PML, though some reports initially suggested its use. Inhbition of retrograde transport of the JCV to the endoplasmic reticulum was investigated by two compounds: retro-2cycl and brefeldin A. Both retro-2cycl and brefeldin A were shown to inhibit JCV infection in vitro, and retro-2cycl was also shown to inhibit infectious spread in cultured cells. However, these compounds remain investigational and so far no studies show their effecacy or safety in humans. In some individuals, especially those with very low CD4+ counts, worsening of PML or new-onset PML can be observed after the initiation of highly active antiretroviral therapy (HAART). This is thought to be secondary to immune reconstitution inflammatory syndrome (IRIS). IRIS is considered as a paradoxical deterioration of a preexisting infection that is related to the recovery of the immune system. It is suggested to occur due to an imbalance of CD8+/CD4+ T cells. Cytosine arabinoside at 2 mg/kg/day for 5 days showed 30% response rate in one study with patients (non-AIDS–related PML ) in whom 85% mortality rate was expected in 1 year. Cytosine arabinoside, however, failed in AIDS patients with PML. The treatment of HIV-2–associated PML is challenging because HIV-2 is not susceptible to nonnucleoside reverse transcriptase inhibitors (NNRTIs). Two nucleoside reverse transcriptase inhibitors (NRTIs) combined with protease inhibitors (PIs) can be tried. Further studies are under way. Bartt RE. Multiple sclerosis, natalizumab therapy, and progressive multifocal leukoencephalopathy. Curr Opin Neurol. 2006 Aug. 19(4):341-9. [Medline]. Bienaime A, Colson P, Moreau J. Progressive multifocal leukoencephalopathy in HIV-2-infected patient. AIDS. 2006 Jun 12. 20(9):1342-3. [Medline]. Verma A. Neurological manifestations of human immunodeficiency virus infection in adults. Neurology in Clinical Practice. 2004. 2: 1581-1602. Focosi D, Marco T, Kast RE, Maggi F, Ceccherini-Nelli L, Petrini M. Progressive multifocal leukoencephalopathy: what's new?. Neuroscientist. 2010 Jun. 16(3):308-23. [Medline]. Zheng HC, Yan L, Cui L, Guan YF, Takano Y. Mapping the history and current situation of research on John Cunningham virus - a bibliometric analysis. BMC Infect Dis. 2009. 9:28. [Medline]. Taoufik Y, Gasnault J, Karaterki A, Pierre Ferey M, Marchadier E, Goujard C. Prognostic value of JC virus load in cerebrospinal fluid of patients with progressive multifocal leukoencephalopathy. J Infect Dis. 1998 Dec. 178(6):1816-20. [Medline]. Vendrely A, Bienvenu B, Gasnault J, et al. Fulminant inflammatory leukoencephalopathy associated with HAART-induced immune restoration in AIDS-related progressive multifocal leukoencephalopathy. Acta Neuropathol (Berl). 2005 Apr. 109(4):449-455. [Medline]. 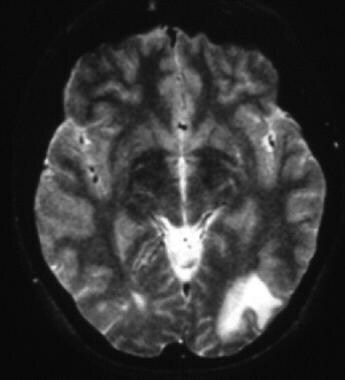 Weissert R. Progressive multifocal leukoencephalopathy. J Neuroimmunol. 2011 Feb. 231(1-2):73-7. [Medline]. Sainz-de-la-Maza S, Casado JL, Pérez-Elías MJ, Moreno A, Quereda C, Moreno S, et al. Incidence and prognosis of immune reconstitution inflammatory syndrome in HIV-associated progressive multifocal leucoencephalopathy. Eur J Neurol. 2016 Feb 23. [Medline]. Tan K, Roda R, Ostrow L, McArthur J, Nath A. PML-IRIS in patients with HIV infection: clinical manifestations and treatment with steroids. Neurology. 2009 Apr 28. 72 (17):1458-64. [Medline]. Di Giambenedetto S, Vago G, Pompucci A, Scoppettuolo G, Cingolani A, Marzocchetti A, et al. Fatal inflammatory AIDS-associated PML with high CD4 counts on HAART: a new clinical entity?. Neurology. 2004 Dec 28. 63 (12):2452-3. [Medline]. Delobel P, Brassat D, Delisle MB, Scaravilli F, Clanet M. Progressive multifocal leukoencephalopathy in an HIV patient with normal CD4 T-cell count and magnetic resonance imaging. AIDS. 2004 Mar 5. 18 (4):702-4. [Medline]. Mascarello M, Lanzafame M, Lattuada E, Concia E, Ferrari S. Progressive multifocal leukoencephalopathy in an HIV patient receiving successful long-term HAART. J Neurovirol. 2011 Apr. 17 (2):196-9. [Medline]. Crossley KM, Agnihotri S, Chaganti J, Rodriguez ML, McNally LP, Venna N, et al. Recurrence of progressive multifocal leukoencephalopathy despite immune recovery in two HIV seropositive individuals. J Neurovirol. 2016 Jan 4. 17 (2):196-9. [Medline]. Sidhu N, McCutchan JA. Unmasking of PML by HAART: unusual clinical features and the role of IRIS. J Neuroimmunol. 2010 Feb 26. 219 (1-2):100-4. [Medline]. White MK, Gordon J, Khalili K. The rapidly expanding family of human polyomaviruses: recent developments in understanding their life cycle and role in human pathology. PLoS Pathog. 2013 Mar. 9 (3):e1003206. [Medline]. Koralnik IJ, Boden D, Mai VX, Lord CI, Letvin NL. JC virus DNA load in patients with and without progressive multifocal leukoencephalopathy. Neurology. 1999 Jan 15. 52 (2):253-60. [Medline]. Jelcic I, Jelcic I, Kempf C, Largey F, Planas R, Schippling S, et al. Mechanisms of immune escape in central nervous system infection with neurotropic JC virus variant. Ann Neurol. 2016 Mar. 79 (3):404-18. [Medline]. Molloy ES, Calabrese LH. Progressive multifocal leukoencephalopathy: a national estimate of frequency in systemic lupus erythematosus and other rheumatic diseases. Arthritis Rheum. 2009 Dec. 60 (12):3761-5. [Medline]. Sharma SK, Soneja M, Ranjan S, Miglani S, Hari S, Sinha S, et al. Progressive multifocal leucoencephalopathy in HIV/AIDS: observational study from a tertiary care centre in northern India. Indian J Med Res. 2013. 138:72-7. [Medline]. Clara- M Schutte. Progressive Multifocal Leukoencephalopathy in Africa: A Review. J Mult Scler. 1:114.:[Full Text]. Khanna N, Elzi L, Mueller NJ, Garzoni C, Cavassini M, Fux CA, et al. Incidence and outcome of progressive multifocal leukoencephalopathy over 20 years of the Swiss HIV Cohort Study. Clin Infect Dis. 2009 May 15. 48 (10):1459-66. [Medline]. Casado JL, Corral I, García J, Martinez-San Millán J, Navas E, Moreno A, et al. Continued declining incidence and improved survival of progressive multifocal leukoencephalopathy in HIV/AIDS patients in the current era. Eur J Clin Microbiol Infect Dis. 2014 Feb. 33 (2):179-87. [Medline]. Antinori A, Cingolani A, Lorenzini P, et al. Clinical epidemiology and survival of progressive multifocal leukoencephalopathy in the era of highly active antiretroviral therapy: data from the Italian Registry Investigative Neuro AIDS (IRINA). J Neurovirol. 2003. 9 Suppl 1:47-53. [Medline]. Christensen KL, Holman RC, Hammett TA, Belay ED, Schonberger LB. Progressive multifocal leukoencephalopathy deaths in the USA, 1979-2005. Neuroepidemiology. 2010. 35 (3):178-84. [Medline]. Clifford DB, Yiannoutsos C, Glicksman M, Simpson DM, Singer EJ, Piliero PJ, et al. HAART improves prognosis in HIV-associated progressive multifocal leukoencephalopathy. Neurology. 1999 Feb. 52 (3):623-5. [Medline]. Berenguer J, Miralles P, Arrizabalaga J, Ribera E, Dronda F, Baraia-Etxaburu J, et al. Clinical course and prognostic factors of progressive multifocal leukoencephalopathy in patients treated with highly active antiretroviral therapy. Clin Infect Dis. 2003 Apr 15. 36 (8):1047-52. [Medline]. Marzocchetti A, Tompkins T, Clifford DB, Gandhi RT, Kesari S, Berger JR, et al. Determinants of survival in progressive multifocal leukoencephalopathy. Neurology. 2009 Nov 10. 73 (19):1551-8. [Medline]. Lima MA, Bernal-Cano F, Clifford DB, Gandhi RT, Koralnik IJ. Clinical outcome of long-term survivors of progressive multifocal leukoencephalopathy. J Neurol Neurosurg Psychiatry. 2010 Nov. 81 (11):1288-91. [Medline]. Rieder CR, Ziomkowski SC. Head tremor and progressive multifocal leukoencephalopathy in AIDS patients: report of two cases. Arq Neuropsiquiatr. 2005 Mar. 63 (1):150-3. [Medline]. [Guideline] Masur H, Brooks JT, Benson CA, Holmes KK, Pau AK, Kaplan JE, et al. Prevention and treatment of opportunistic infections in HIV-infected adults and adolescents: Updated Guidelines from the Centers for Disease Control and Prevention, National Institutes of Health, and HIV Medicine Association of the Infectious Diseases Society of America. Clin Infect Dis. 2014 May. 58 (9):1308-11. [Medline]. Lima MA, Drislane FW, Koralnik IJ. Seizures and their outcome in progressive multifocal leukoencephalopathy. Neurology. 2006 Jan 24. 66 (2):262-4. [Medline]. Sudhakar P, Bachman DM, Mark AS, Berger JR, Kedar S. Progressive Multifocal Leukoencephalopathy: Recent Advances and a Neuro-Ophthalmological Review. J Neuroophthalmol. 2015 Sep. 35 (3):296-305. [Medline]. Whiteman ML, Post MJ, Berger JR, Tate LG, Bell MD, Limonte LP. Progressive multifocal leukoencephalopathy in 47 HIV-seropositive patients: neuroimaging with clinical and pathologic correlation. Radiology. 1993 Apr. 187 (1):233-40. [Medline]. Bossolasco S, Calori G, Moretti F, Boschini A, Bertelli D, Mena M, et al. Prognostic significance of JC virus DNA levels in cerebrospinal fluid of patients with HIV-associated progressive multifocal leukoencephalopathy. Clin Infect Dis. 2005 Mar 1. 40 (5):738-44. [Medline]. Aksamit AJ Jr. Progressive multifocal leukoencephalopathy: a review of the pathology and pathogenesis. Microsc Res Tech. 1995 Nov 1. 32 (4):302-11. [Medline]. Berger JR, Aksamit AJ, Clifford DB, Davis L, Koralnik IJ, Sejvar JJ, et al. PML diagnostic criteria: consensus statement from the AAN Neuroinfectious Disease Section. Neurology. 2013 Apr 9. 80 (15):1430-8. [Medline]. Brew BJ, Davies NW, Cinque P, Clifford DB, Nath A. Progressive multifocal leukoencephalopathy and other forms of JC virus disease. Nat Rev Neurol. 2010 Dec. 6 (12):667-79. [Medline]. Pavlovic D, Patera AC, Nyberg F, Gerber M, Liu M, Progressive Multifocal Leukeoncephalopathy Consortium. Progressive multifocal leukoencephalopathy: current treatment options and future perspectives. Ther Adv Neurol Disord. 2015 Nov. 8 (6):255-73. [Medline]. Travis J, Varma A, duPlessis D, Turnbull I, Vilar FJ. Immune reconstitution associated with progressive multifocal leukoencephalopathy in human immunodeficiency virus: a case discussion and review of the literature. Neurologist. 2008 Sep. 14 (5):321-6. [Medline]. De Luca A, Fantoni M, Tartaglione T, Antinori A. Response to cidofovir after failure of antiretroviral therapy alone in AIDS-associated progressive multifocal leukoencephalopathy. Neurology. 1999 Mar 10. 52 (4):891-2. [Medline]. Huang SS, Skolasky RL, Dal Pan GJ, Royal W 3rd, McArthur JC. Survival prolongation in HIV-associated progressive multifocal leukoencephalopathy treated with alpha-interferon: an observational study. J Neurovirol. 1998 Jun. 4 (3):324-32. [Medline]. Aksamit AJ. Treatment of non-AIDS progressive multifocal leukoencephalopathy with cytosine arabinoside. J Neurovirol. 2001 Aug. 7 (4):386-90. [Medline]. Table 1. Establishing the diagnosis with clinical, radiographic, and laboratory data. Table 2. Establishing the diagnosis with histopathology.